All of Washington's economic threats to Russia are designed to force the Russian government into accepting vassal status, like all of Europe, Canada, Australia, and Japan. 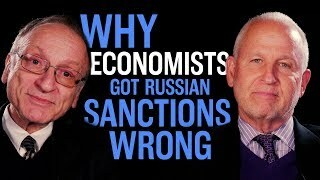 The threats can only work because the Russian government and the Economics Institute of the Russian Academy of Sciences have ignored the lessons that Michael Hudson and I taught them. See here, here and here. Here is how Washington's current effort to destroy Russia's confidence is being played. First Washington announces that it is considering banning everyone in the world from buying a Russian government bond. Citibank, regarded by many as a criminal organization totally dependent on Federal Reserve subsidies, puts out a fabricated "analysis" that, to quote from Bloomberg, would cause the ruble to "plunge by as much as 15 percent and borrowing costs would spike to a three-year high if the U.S. goes ahead with proposals to impose sanctions on Russian government bonds, according to a new model developed by Citigroup Inc." Citi analysts Ivan Tchakarov and Artem Zaigrin said: "The additional capital outflows generated by this event could ultimately weaken the ruble." If, on the other hand, the Russians would like to free themselves of their neoliberal economic brainwashing, all the Russian central bank needs to do is to buy the Russian bonds that Washington forces its vassals to sell. This is precisely what the US, UK, EU, and Japanese banks have been doing for a decade -- purchasing their own bonds (and stocks) -- thus driving up the price. This is how zero/negative interest rates in the Western alliance have been achieved. Some time ago Michael Hudson and I pointed out to the Russian government and central bank that the utterly false belief that rules Russia that Russia's development is dependent on foreign loans and selling valuable Russian assets to foreigners for foreign exchange is totally false. The Russian government is trapped in a mindset engineered by Washington. Hudson and I pointed out in terms that could not be clearer that when Russia borrows abroad for a development plan, the dollars are not spent inside the Russian economy. The borrowed dollars (or UK pounds, EU euros, Japanese yen) go into the central banks' foreign reserve holdings. The central bank then prints the ruble equivalent to finance the development project. It is clear as day to anyone not brainwashed by American neoliberal economists, who are agents of Washington, that there is no point whatsoever in Russia's foreign borrowing. The Russian central bank can create the rubles to finance Russian development projects independently of borrowing from abroad. All borrowing from abroad does is to enlarge Russia's foreign debt, thereby making Russia more susceptible to Washington's sanctions.